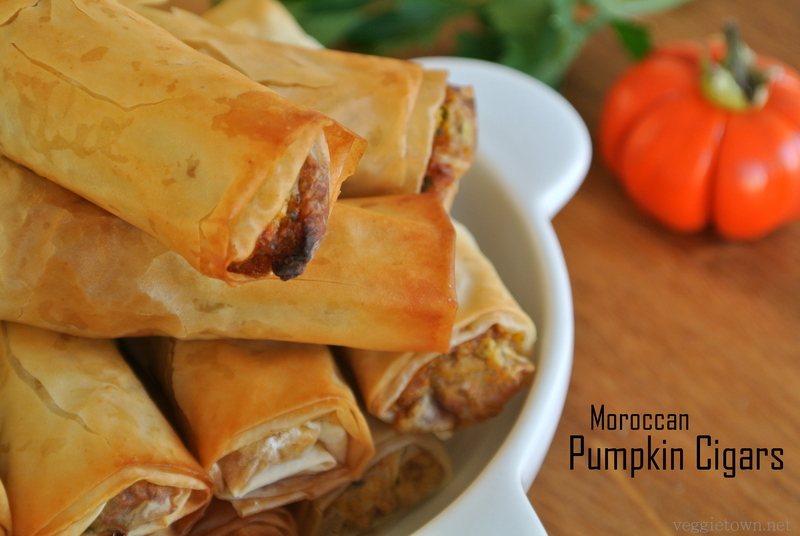 Share these Moroccan Pumpkin Cigars with your family and friends at your upcoming Halloween celebration. They are perfect as a starter, snack or as a part of a bigger meal or buffet. You may find small rolls made of filo dough in many of the world’s kitchens but I ate my first at a Moroccan buffet so to me they will always be Moroccan. I usually fill them with feta cheese and they have always been highly appreciated when served like that but this time I wanted to make a vegan version. Since Halloween is just around the corner and since the supermarkets are full of pumpkins it was not difficult to decide which filling to go for. I love the combination of oven roasted pumpkin and almond. Together with the fresh herbs the flavor becomes incredible. This time I baked the cigars inside the oven but you may also deep fry them. To be honest with you I do prefer the deep fried version but they are still very tasty both ways. Since the filling is on the creamier side I don’t think there’s a need for a dipping sauce. They taste great just as they are! 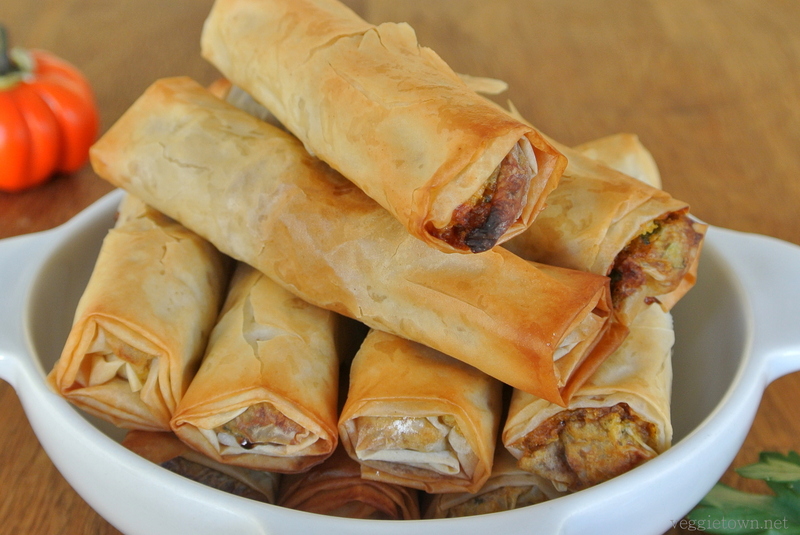 If you use frozen filo dough you start by taking it out from the freezer. Heat the oven to 150°C/392°F. Roast the almonds for about 20 minutes. Set aside to cool. Heat the oven to 175°C/345°F. Remove the skin and the seeds from the pumpkin. Divide it in medium sized pieces and place in a bowl. Cut the onion in bigger pieces and add to the bowl together with three whole cloves of garlic. Add the vegetable oil and stir until everything is covered in oil. Roast in the middle of the oven until the vegetables are soft and with a slightly roasted or grilled surface. A lot of the flavor comes from the grilled surface so make sure you leave the vegetables until it appears. Mix the almonds roughly in a food processor. Add the pumpkin, onion and garlic. Mix until you have a chunky mash. Remove to a bowl and add the fresh herbs and the salt. Open the filo package and cover the dough with a damp kitchen towel. This way it won’t become dry and difficult to work with. Cut the filo dough in smaller rectangles. Place a spoon of the pumpkin mash close to one of the short ends. Fold in the sides and start rolling the sheet upwards. Brush the two last inches of the sheet with a little water to seal the roll properly. Continue until the mash is finished. Brush the cigars with oil and bake inside the oven for about 25 minutes or until golden brown. For better flavor (but less healthy) deep fry until golden brown. The cigars taste the best when they are still warm but they may also be served room tempered. Enjoy! 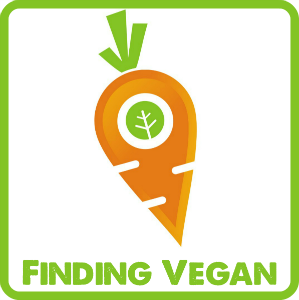 This entry was posted in Okategoriserade, Side Dish, Sweets and Snacks. Bookmark the permalink.